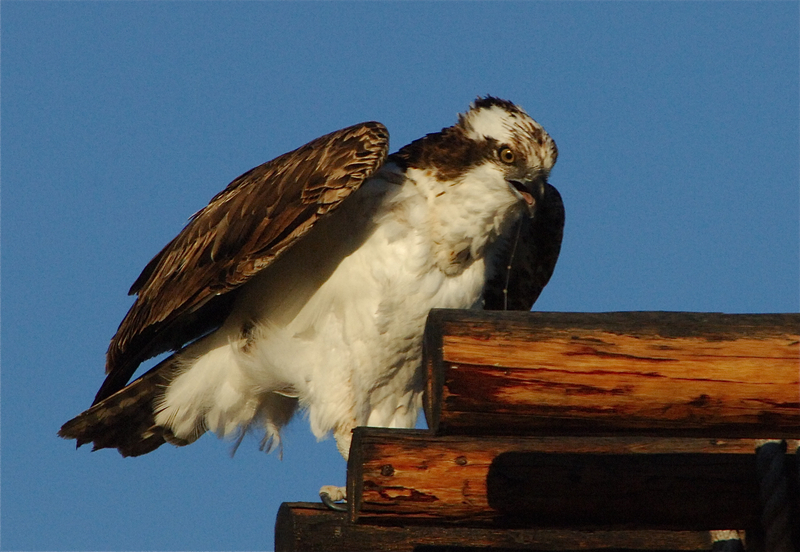 Delight of delights .. an osprey has taken up morning residence on my neighbor’s roof. The property is adjacent to the shallow estuary created by the carved earth of the arroyo. The heron and egrets are usually morning visitors, along with sandpipers and godwits. Five mornings in a row, however, the osprey has been perched on the rafters above my neighbor’s porch. Could be that the persistent winds have made fishing in the open sea a challenging task, and the shallow tidal zone offers more promise of a meal. Whatever the reason, I am thrilled to have the fish hawk as a morning visitor. I’ve long thought of the bird as a personal totem, and reslish chance to observe his antics more closely. This entry was posted in Baja Living, Birds, Loreto. Bookmark the permalink.